This is just a quick note to let folks know that all is basically well here, and I have a post that I have been working on for more than twenty-four hours. Not that it is that large or complex a piece of writing, but that it is crazy around here. Kat is fine. As you can see. 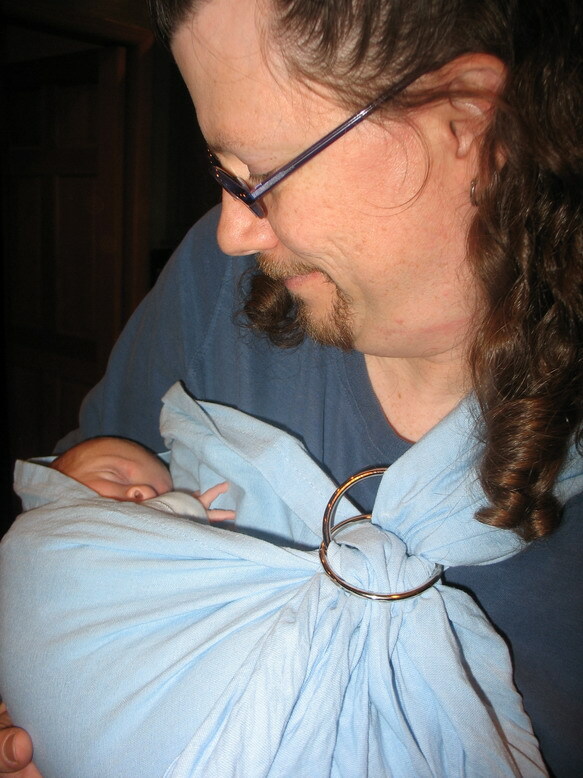 (Zak has really gotten into the idea of babywearing and has started collecting slings and carriers so he can keep Kat close and still do stuff all day.) She now weighs seven pounds six ounces; she has gained three ounces in the past three days. She is sleeping less at night, but we are working on that issue with diligence and care. The kitties are all fine, as are Zak and I.
I ran to the bathroom, which is the main one, and the one Morganna uses, and saw the lady backed into a corner of shower, surrounded with shattered glass from the shower door. It was absolutely horrifying.It was safety glass, but she was in there in her sock feet. She started to take a step toward me while abjectly apologizing–and I firmly told her to stay put. She thought I was mad at her. I wasn’t. I was terrified that she had been hurt or that she would cut open her foot if she moved. Luckily, the shoes were fetched, and put on with no cutting or bleeding. I am just glad that Morganna wasn’t in there when it happened, showering. So, we need to replace the shower door. I hope that nothing else breaks anytime soon, is all. And yes, someday soon, I will finally post the roundup to the Spice is Right IV: Back to School that I was going to post on the day I went into labor and delivered Kat. What an adorable picture. I don’t know who is cuter – Kat all snug and snoozing in her sling or Zak watching her in such adoration. Sounds like Kat is thriving from love and good food. Barbara, I am glad that nobody was hurt. And Dad and baby are precious! BIG AWWWW! Barbara, thanks for the kind words. It was our pleasure to provide the house cleaners. When it rains it pours… Good luck getting everything back into working order!